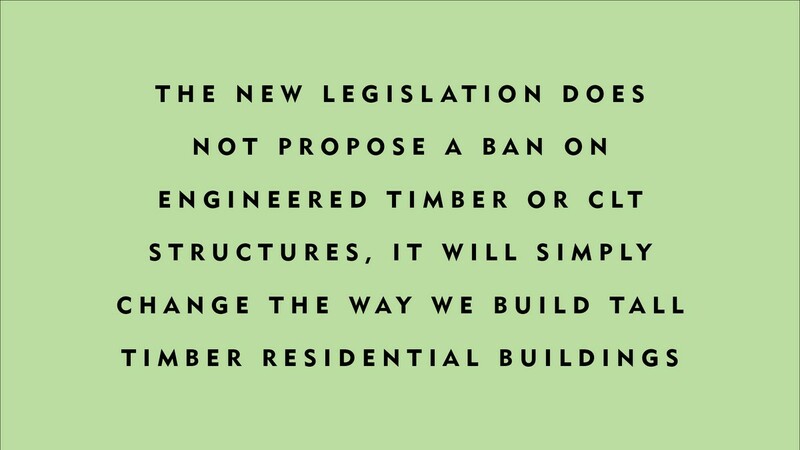 The new legislation does not propose a ban on engineered timber or CLT structures, it will simply change the way we build tall timber residential buildings. Engineered timber is a revolutionary building material that enables us to build more quickly, more efficiently and to higher standards of quality. By creating buildings that are carbon stores we can help to tackle climate change, the defining issue of our age. It was and remains clear that in the wake of the tragic events at Grenfell Tower changes were needed to the construction industry and particularly in the way that external facades are designed, engineered and delivered. On the whole the new legislation should be welcomed from that perspective. However, we are clear that mass timber construction is not a valid target for this change and will continue to advocate for its exemption. The government’s decision is therefore disappointing in overreaching its stated aim, and demonstrates a misunderstanding of the fire performance of engineered timber. The UK is a world leader in the development of engineered timber construction with over 500 buildings completed. As the government acknowledges this change in regulations will have an impact on the continued innovation and development of low carbon construction, and hence on the rate at which the construction industry can tackle climate change. It is imperative that architects recognise the impact of their work on the environment. Waugh Thistleton Architects will continue to research, design and build using low carbon technologies and reduce our reliance on concrete and steel.